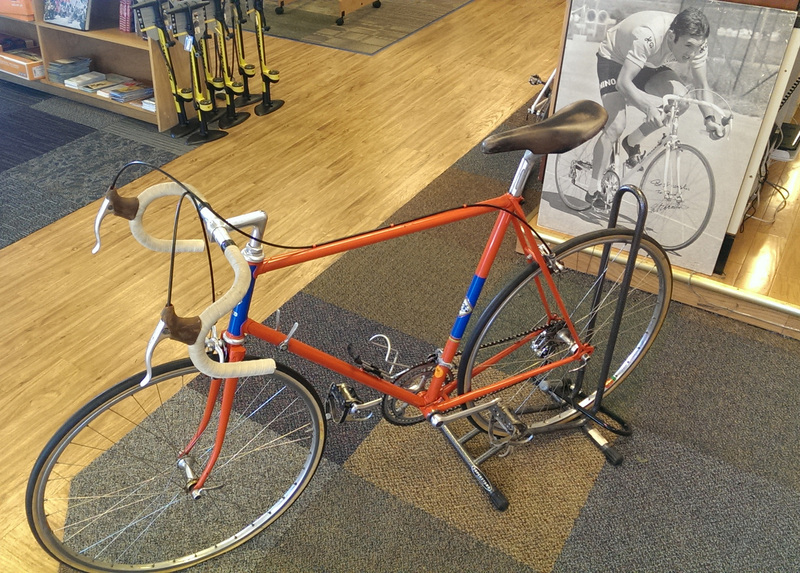 A bike owned and ridden by Eddy Merckx is on display at the Bicycle Outfitter. Imagine my surprise when I was shown a genuine Eddy Merckx bike on display in Bicycle Outfitter. It was given to owner Bud Hoffacker in exchange for some print/catalog work requested by Eddy back in 1970. I don’t know if it was raced on. About half of the equipment is vintage and the frame is Swiss, by Allegro. Eddy won the Tour de France in 1970. This entry was posted on February 29, 2016 at 4:57 pm and is filed under News. You can follow any responses to this entry through the RSS 2.0 feed. You can leave a response, or trackback from your own site. I brought my wife into the shop this afternoon to test ride a touring bike. She glanced at this bike and asked me if it was the one for her to ride. Admittedly, she had never ridden a touring bike and didn’t know what to expect.